Faithful process from the parish grotto into Our Lady of Pompeii Church, with a statue of their parish namesake, Saint Pio of Pietrelcina, last Sunday before an 11 a.m. Mass. The weekend included veneration of the relic heart of Saint Pio and the 14th annual festival that bears his name. VINELAND — M.J. Ricci is one of many people who believes she has personally seen the healing power of Saint Pio of Pietrelcina, and came here with a story to tell of the saint’s miraculous intercession. Ricci, of Wildwood, her sister Mary, friends — and thousands of others — came to the saint’s namesake parish and Our Lady of Pompeii Church last weekend to pray, to tell stories about the saint, and to venerate the heart of a merciful Capuchin friar who loved the Lord. The first-class relic arrived on Saturday night, accompanied by the Capuchin friars from Italy’s San Giovanni Rotondo, Saint Pio’s hometown. 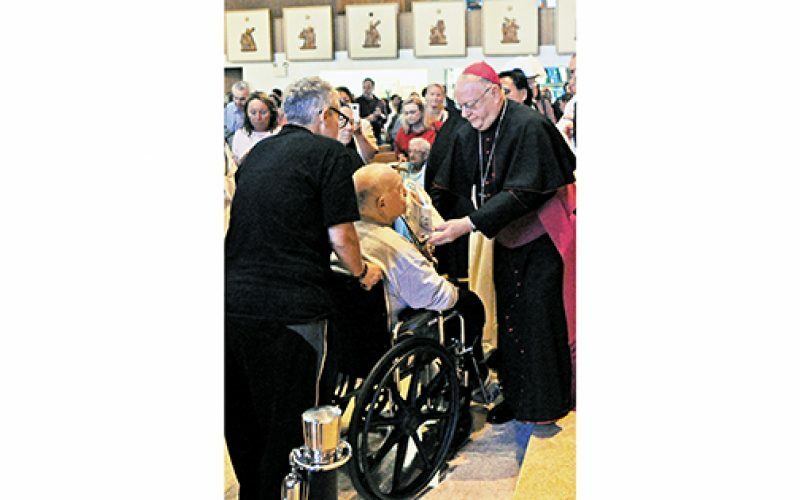 Its visit followed several stops in the Archdiocese of Boston, and, after its departure from Vineland on Sunday night, was headed to a monastery in the Archdiocese of Philadelphia. The opportunities for the faithful to venerate the heart in the United States marked the first time a major relic of Saint Pio’s has traveled outside Italy. Padre Pio died in 1968 at the age of 81 and was canonized in 2002. The Capuchin friar was popular as a miracle worker and known particularly for the long hours he would spend hearing confessions. 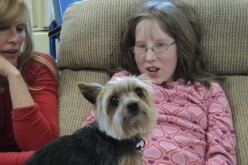 The relic’s visit to Vineland came days after his feast day on Sept. 23. An 11 a.m. Sunday morning Mass was preceded by a procession with the first-class relic from the parish grotto into the church. 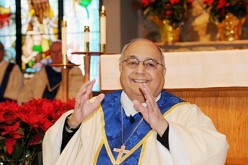 “Padre Pio’s heart was so full of love for Christ and for his church, for the Eucharist and for our Blessed Mother, for the sick and for the poor that it is only right that it is his heart that still remains,” said Father Robert Sinatra, pastor of Saint Padre Pio Parish, in his homily to those packed in the church and the overflow watching from outside the church on a Jumbotron. After Communion, Bishop Dennis Sullivan addressed the thousands gathered, and recalled the saint who bore the stigmata, the wounds of Christ, for over 50 years, was known for his long hours of hearing confessions. 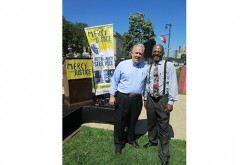 “God gives us channels of mercy, and this saint is certainly one of them,” he said. Father Sinatra said an estimated 8,000 people came to his parish last weekend to venerate the heart of Saint Pio and enjoy the 14th annual Saint Padre Pio Festival, which included food, drink, a rock-climbing wall and caricature paintings. The nearby Saint Mary School even got into the spirit, creating portraits of Saint Pio that were then voted on by festival participants. 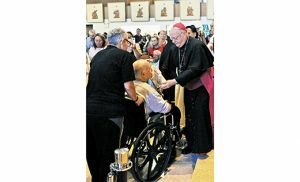 The “spiritual and cultural experience demonstrated the people’s devotion and fervor for Padre Pio, and for Christ,” he said. 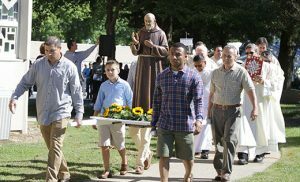 Thousands made their way to the South Jersey town of Vineland last weekend to venerate the relic heart of Saint Pio of Pietrelcina, a 20th century Capuchin friar who bore the stigmata, the wounds of Christ, for over 50 years, and gave his whole heart to Jesus and the Blessed Mother. 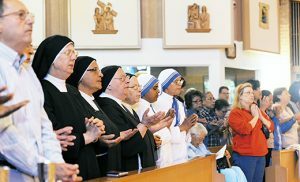 Above, religious sisters among the faithful at Our Lady of Pompeii Church, Saint Padre Pio Parish. Below, Bishop Dennis Sullivan holds the first class relic of Saint Pio as a pilgrim venerates it.